Today we have a spooky sewing treat for you to try your hand at, this super cute Pumpkin Pincushion. 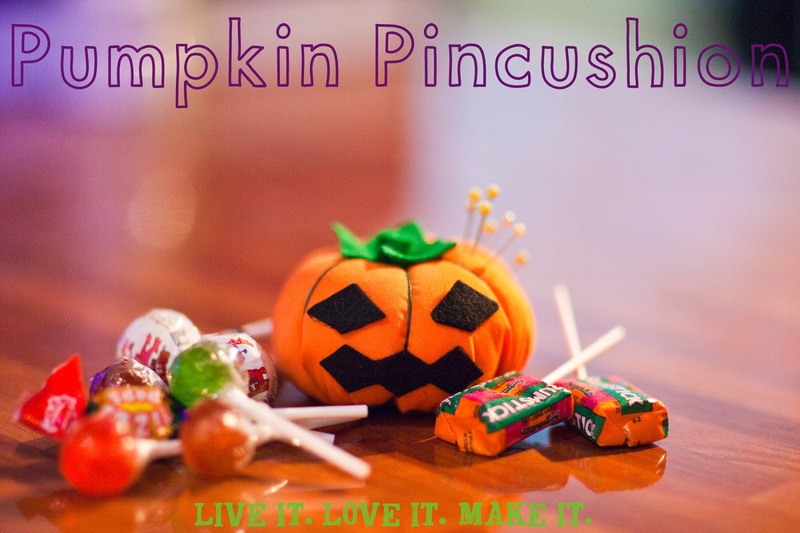 The best thing about this tutorial is that you can use it to make normal pincushions with pretty cotton fabrics all year round as well as these Halloween style ones, just pick a fabric of your choice. So let's get on and show you how we made this little guy. You will need: Cotton or polycotton fabric, A side plate,Thread, Embroidery thread, A needle, Scissors, A pen or pencil, glue, Stuffing or sawdust, Two scraps of felt. We started by drawing around our side plate to get a good circle. We took our scissors and cut it out. We used our needle and thread to sew a running stitch all the way around the edge of the circle making sure that our first stitch was really secure. When we had stitched all the way around we pulled up our stitches to make a little pouch. We stuffed the pouch until it was really firm. Then we took our embroidery thread and pushed it from the bottom all the way through the centre of the pincushion. We took our needle round the outside and pushed the needle through the same way again, creating a stitch that runs all the way around the outside of the pincushion. Then repeated this all around the cushion about eight times. You can see it is starting to look a little pumpkin-ish now. We cut two circles of felt to make the top and the bottom. You can see we cut the edges of our second circle to look more like a pumpkin top, but you can just leave it as a circle if you prefer. Then we glued the bottom piece in place over the opening where we put our stuffing in. Use plenty and glue all the way to the edges. We glued the top of our pumpkin in place with a dab of glue just in the centre, to give a more 3D effect. We made our stalk by cutting a small length of felt and gluing it in to a spiral. Then we glued the stalk in place. Next we cut out a spooky face for our pumpkin out of black felt and glued it in place. And here he is, our little Pumpkin Pincushion, ready just in time for holding your pins whilst running up a quick costume in time for tomorrow night. As I said it would be really easy to make this in a regular pretty fabric and leave off the stalk and face to make a great gift for your sewing friends, or for your own sewing room. Hope you enjoyed our little Halloween treat, Are you off Trick or Treating tomorrow or at the weekend? What outfits will you be wearing? Not sure, Check out Sammy's Low Maintenance Halloween outfits post.